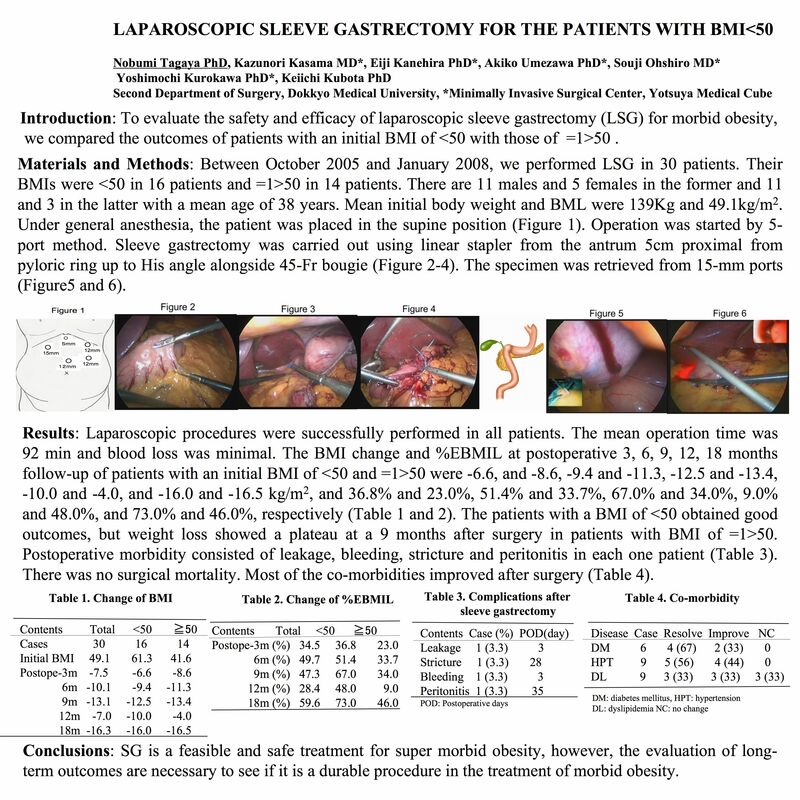 Introduction: We evaluate the safety and efficacy of laparoscopic sleeve gastrectomy (LSG) for morbid obesity. Materials and Methods: Between October 2005 and January 2008, we performed LSG in 30 patients. Their BMIs were 50 in 14 patients. There are 11 males and 5 females in the former and 11 and 3 in the latter with a mean age of 38 years. Mean initial body weight and BML were 139Kg and 49.1kg/m2. Under general anesthesia, the patient was placed in the supine position. Operation was started by 5-port method. Sleeve gastrectomy was carried out using linear stapler from the antrum 5cm proximal from pyloric ring up to His angle alongside 45-Fr bougie. The specimen was retrieved from 15-mm ports. Results: Laparoscopic procedures were successfully performed in all patients. The mean operation time was 92 min and blood loss was minimal. The BMI change and %EBMIL at postoperative 3, 6, 9, 12, 18 months follow-up of patients with an initial BMI of 50 were -6.6, and -8.6, -9.4 and -11.3, -12.5 and -13.4, -10.0 and -4.0, and -16.0 and -16.5 kg/m2, and 36.8% and 23.0%, 51.4% and 33.7%, 67.0% and 34.0%, 9.0% and 48.0%, and 73.0% and 46.0%, respectively. The patients with a BMI of 50. Postoperative morbidity consisted of leakage, bleeding, stricture and peritonitis in each one patient. There was no surgical mortality. Most of the co-morbidities improved after surgery. Conclusions: SG is a feasible and safe treatment for super morbid obesity, however, the evaluation of long-term outcomes are necessary to see if it is a durable procedure in the treatment of morbid obesity.